The first licence for a nonconformist meeting in the village was issued in 1780, for the house of Henry Lovett. Further licences were issued in June 1799 for Thomas Thompson’s house and in 1801 for the house of Elizabeth Collier. No denomination is recorded against any of these licences, and whether this was a single group that met in several places, or more than one group, is not known. Groby’s first nonconformist chapel was built in 1825, at a cost of £120, on land given by framesmith Thomas Sutton to the ‘Free Methodists of Groby’. He may have been related to Job Sutton, who signed the application for the meeting house licence in 1801. The meeting house return of 1829 describes the congregation as Wesleyan Methodist, and numbering about 70. In 1851 the chapel was described as Wesleyan Methodist, and contained 52 free and 50 other sittings. Numbers attending seem to have been in decline, with between fifteen and twenty people attending on most Sunday afternoons, and around twice that number in the evening, and the Sunday school which is mentioned in 1828 apparently no longer met. It is not clear what happened to that congregation, for the following year the chapel was purchased by the Independents for £60. It was rebuilt in 1858, to seat 180 people. Pictures show that it was a plain red brick building, with no windows on the ground floor. The plans may have been optimistic, as when the Anglican vicar completed the 1875 visitation questionnaire he reported that not more than 20 families from the village attended, and that their children attended the Anglican Sunday School.In 1880, services were held each Sunday afternoon and evening, and there was also a service on Tuesday evenings. This church appears to have been associated with both the Congregational church in Oxford Street, Leicester and that at Anstey. In March 1881 the Charity Commissioners agreed a scheme vesting the legal estate in new trustees for a Free Methodist chapel. 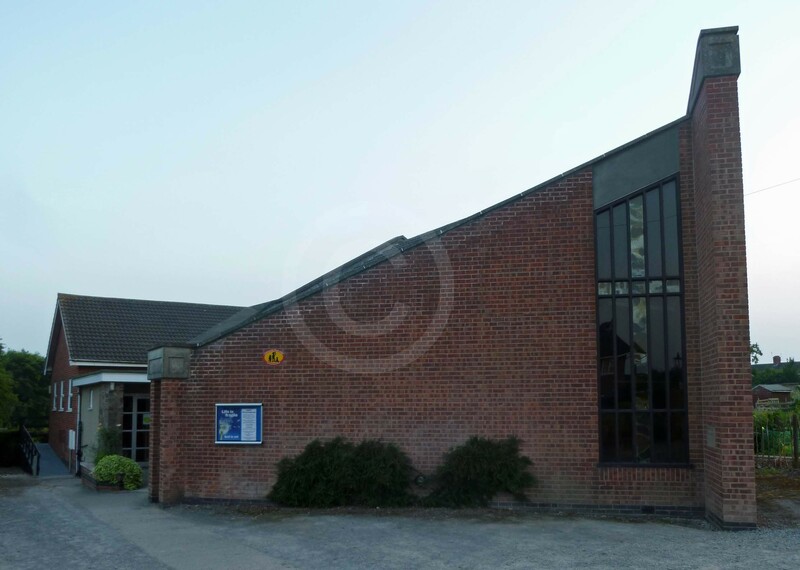 In 1893 it was still described as a Free Methodist Chapel in charity returns, although most directories record its denomination as Congregational. A tablet which is now on the outside of the new chapel bears the words: ‘Congregational Chapel’. The building was demolished in 1981 and a new chapel built. It is now a United Reformed Church. ROLLR, QS 44/1/2, QS 44/2/128; QS 44/2/144. TNA, HO 129/413/45; Leicester Chronicle, 5 Dec. 1828, p. 3. W. White, History, Gazetteer & Directory of Leicestershire & Rutland (1863), p. 706; Kelly’sDirectory of Leicestershire & Rutland (1912), p. 89; plaque in current church states ‘Congregational’. To make a secure donation to Leicestershire Victoria County History Trust (registered charity 1128575), please use the Paypal button below, or contact us using the form below left. If you are a UK taxpayer, we should be grateful if you would also sign a Gift Aid form. Click on the Easyfundraising logo below, find your online retailer through their site, name us as your favoured charity, then shop as usual. We will receive a donation from that retailer at no extra cost to you. Most major retailers are in this scheme, so please remember us every time you shop online.